I have a sinking feeling that Henny Penny met with an unfortunate even a few nights ago. She had still, all this time later, been sitting on a group of eggs in the back of one of the greenhouses. She has steadfastly refused to leave her little corner, even though those eggs must be pretty nasty by this time. 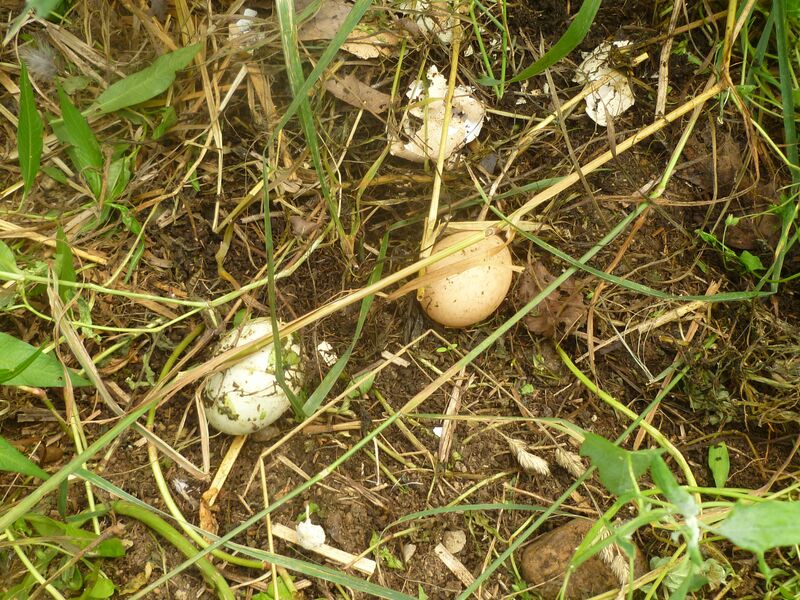 We have been noticing that all (well, it seems like all) the painted turtle nests in the yard around the house have been uprooted and the eggs broken open and scattered. Every morning for the last few weeks we have found more dug up like that. We know that frequently that can be the work of a skunk, but we haven't sniffed any evidence. 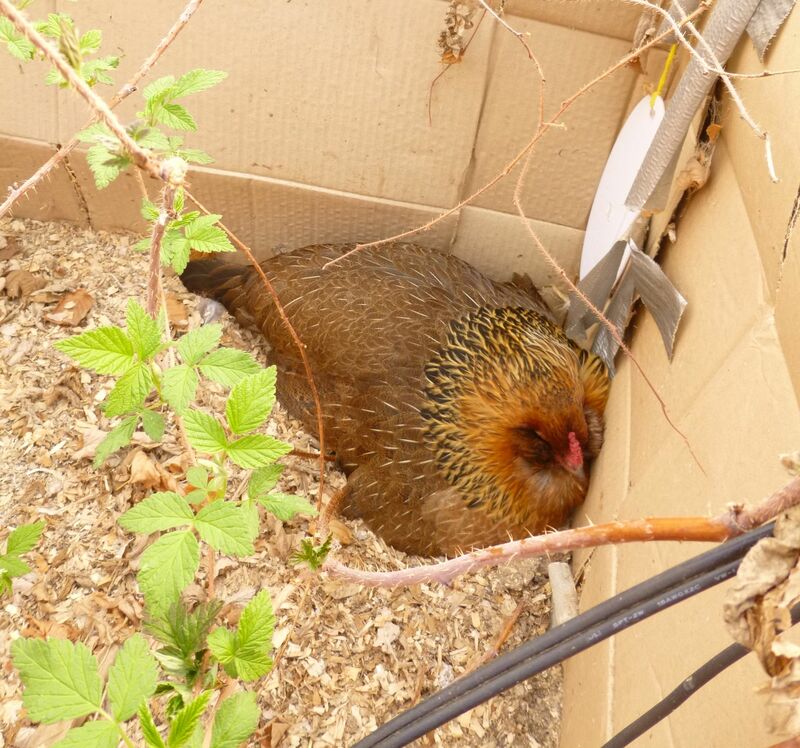 Early this week John went out to check on Henny Penny and she was mad as a little hornet… all her eggs were gone, and there was a piece broken out of the cardboard area in which she is nesting, right behind her. John figured it was most likely a skunk as we think a raccoon would just go right over an 18″ high cardboard wall. I was relieved that she was ok, but I believe that she was going in there at night even though her eggs were gone. I don't know, maybe she had creeping chicken dementia, she is a really old girl, about 5! On Saturday I went out to do chores about 6:30 in the morning and after I was done, I realized that Henny Penny, aka Bad Chicken #1, had not been hovering around my feet begging for grain tidbits. 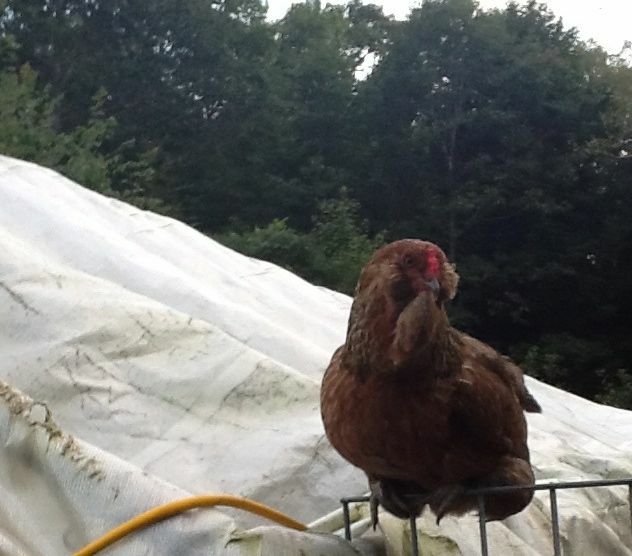 I looked around the compost piles, as they are some of her favorite places to peck into – nice worm opportunities – and nothing. Later in the day I did a more thorough search and was disheartened as I didn’t find her anywhere. I was moaning about it to my husband that night, saying that I knew it had to happen eventually, but also about how much I would miss her. He laughed and said that he knew where she is hanging out… she has gone broody again and is sitting on a little stockpile of eggs! 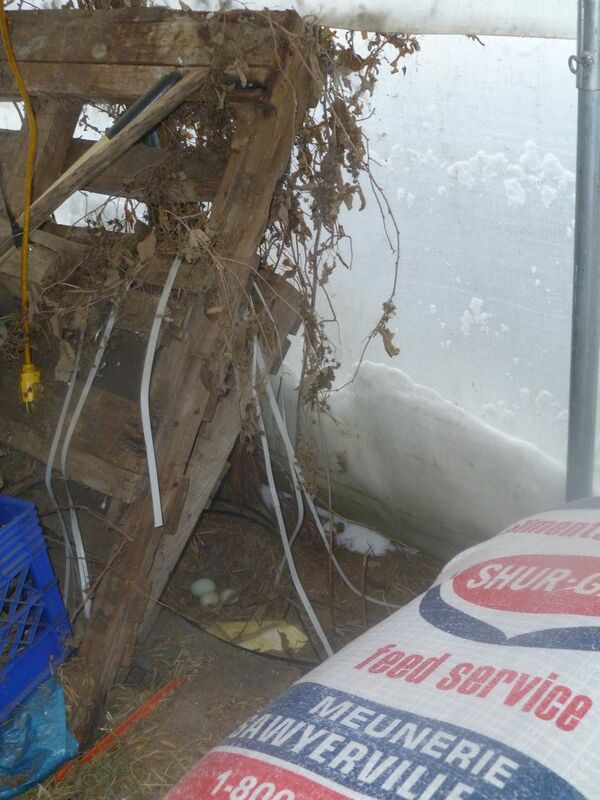 In the back of one of our greenhouses we still have a brooder setup that we use for brooding our meat birds, and she has been laying her eggs there. John has been collecting them, but he marked the old ones that we hadn’t found right off, and was just taking her one new egg each day. (How a 4 year old hen is still laying eggs regularly, I don’t know!). I am glad to know that she is safe, so far, and she even made a very brief appearance on Sunday to forage for some green stuff. And my husband was way ahead of me when he said that he had gone to the neighbor to get some fertile eggs to put under her. She has been sitting on a glorious pile of infertile green-shelled eggs. 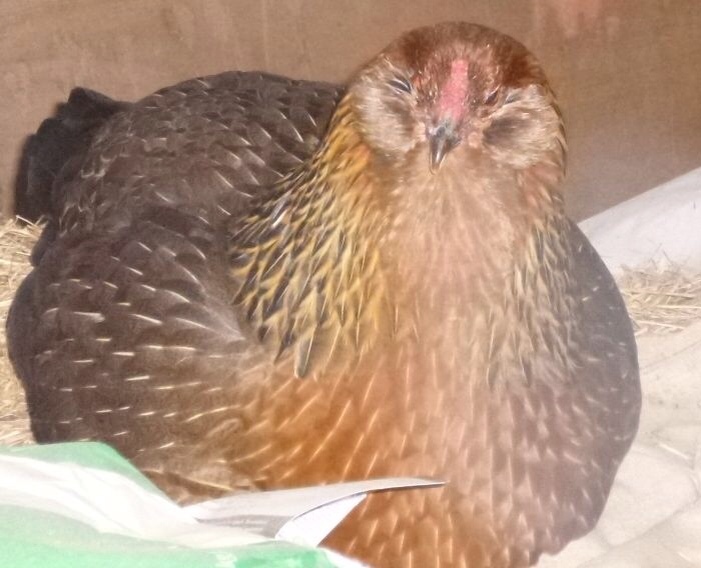 Hopefully the brown eggs John tucked under her will hatch. They will be Barred Rocks. It would be lovely to have a few chicks! Our sweet Henny Penny, the last remaining rogue chicken-on-the-loose, has finally exited her hide-out in the milking greenhouse. When the really deep snow fell just after Christmas she took up residence on the far end of that structure. She roosts in there and has been spending her days in there as well. I put a little pan of grain nearby for her, but her “real” hanging chicken feeder is in the greenhouse we use to store hay and grain. It’s about 30 feet away and it must have seemed like at least a continent away to her in the blustery wind and the piles of snow. I have worried about her accessing water, but when I put out little pans of it, it has just frozen up so fast that I never knew if she had gotten any. She is a 3 and a half year old survivor, so I have just presumed that she will survive if it’s meant to be. 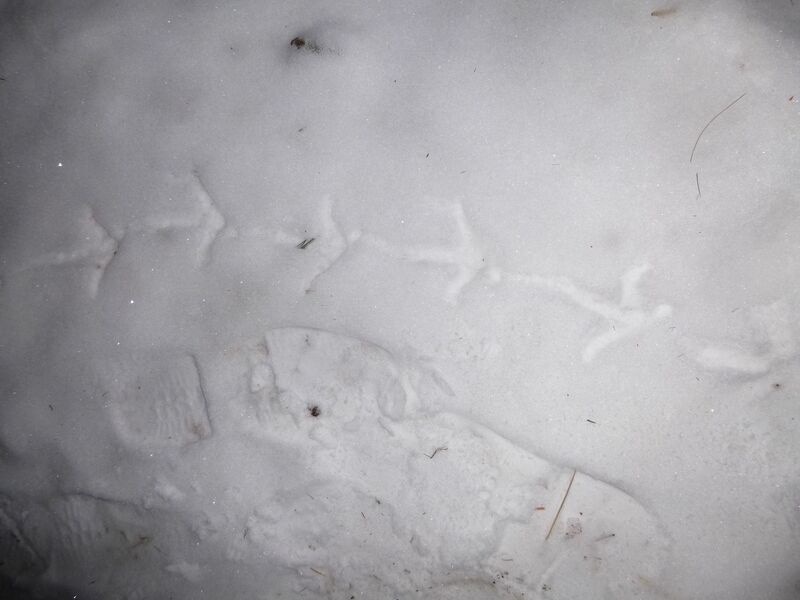 Henny Penny tracks in the snow! Yesterday and today we have had some sun and daytime temps into the mid to upper 30s. (Nice for some of the ice melting in the parking lot at work). 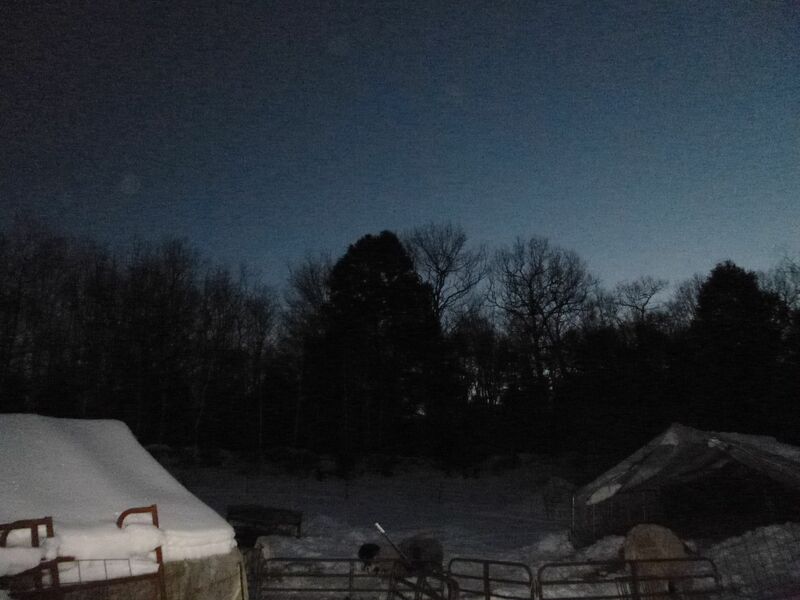 When I went out to chores this afternoon I was very pleasantly pleased to see all kinds of chicken prints in the snow between the two greenhouses, as well as some tossed hay in that greenhouse (as well as some plump chicken poops!). When I was milking she was already roosting back in the milking greenhouse, but I am hoping that she continues to wander out in this lovely January thaw! It’s always the way. We just get used to having chicken entertainment behind the house as well as up near the sheep and goat pens, and things have changed again. 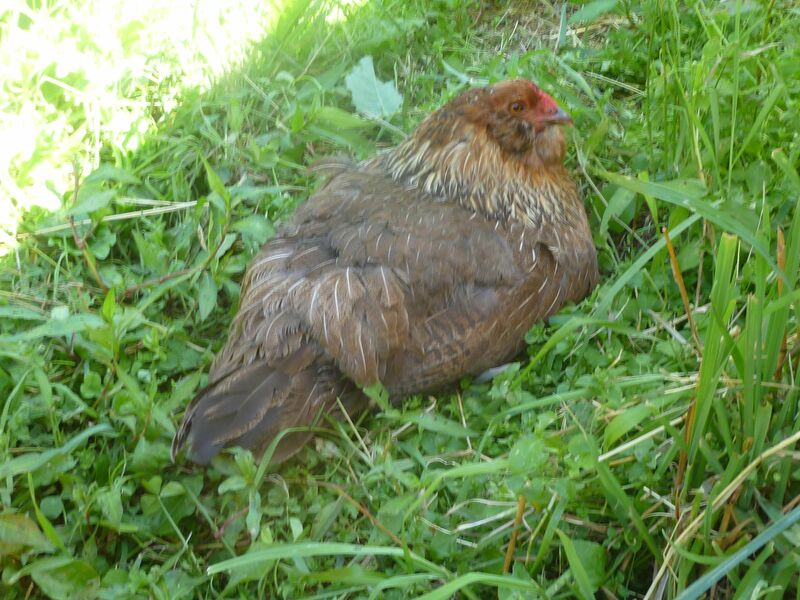 Bad Chicken #2, aka Chicken Licken, disappeared sometime in August. I can’t say that I am altogether unhappy at not having to avoid a chicken underfoot on the back stairs as well as all her little surprises on the stairs and on the path, but chickens are such great animals they are addictive to watch. And when the windows are open in the warm weather I could always just hear her soft clucking and chattering somewhere in the background, singing with the crickets and cicadas. I still watch out for her as I go down the steps, but she seems to have disappeared very completely. We have had some foxes in the area, and it wouldn’t surprise me if she went home with one of them. Life in the chicken fast lane is sometimes not so pretty. Bad Chicken #1, aka Henny Penny, is stil alive and kicking however. She roosts in a spot that I would have thought a little dangerous and open to an owl attack, but she seems to be hanging in there. She has her own whole feeder which I have left in the hay greenhouse, always stocked with a little scratch and some layer pellets. She is nice company at chore time, and dances around my feet hoping that I will drop some of the goat’s sweet feed as that is her all-time favorite. And she is even leaving us eggs about 5 out of 7 days a week. One green-blue egg a day in the long grass is kind of a nice treat for John in the morning. We are grateful for anything she shares with us, and I look forward to her company each day! I keep hoping that time will slow down and that somehow a few more days can be slipped into each of these precious summer weeks. Too much to do, and some relaxing fun things would be lovely as well. The weather has had quite a few ups and downs… with some extremely hairy storms this past Tuesday evening. I was at a meeting a little way down the peninsula and the wind was blowing and the rain came down in sheets for quite awhile. 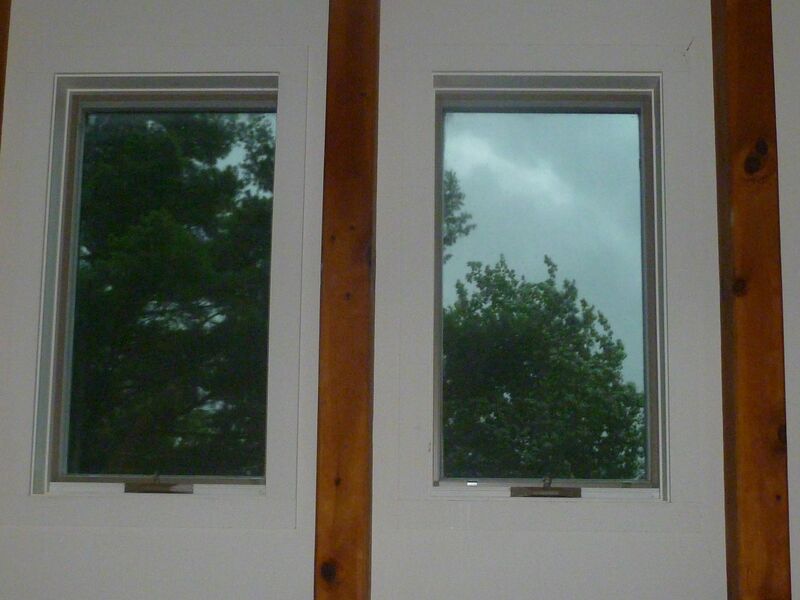 After it began to let up, we all pointed to the slightly yellowy-grey weird sky color. It’s what I call a tornado sky. We all joked that it couldn’t be the case, but today I heard on the news that a tornado did touch down in Woolwich, which is just about 10 miles south of here on Route 1. So we really weren’t crazy. Of course, it measured a “0” on the Fujita Scale, but nevertheless, it was quite dramatic. (Not that I want to see one come through here as more than a “0” at all. We have enough crazy North Easters to deal with during the year). Yesterday was fantastically gorgeous and I had serious intentions for dyeing or felting, but I ended up at work for the morning and when I came home I couldn’t resist sitting down with lunch and reading just one more chapter of the second book in Carol Drinkwater’s series about the olive farm that she and her husband took on in the south of France. Being home alone, I ended up having another cup of coffee and I kept reading! It was a delicious way to spend the afternoon, and now of course I want to read the third book, but sadly, do not have a copy yet. 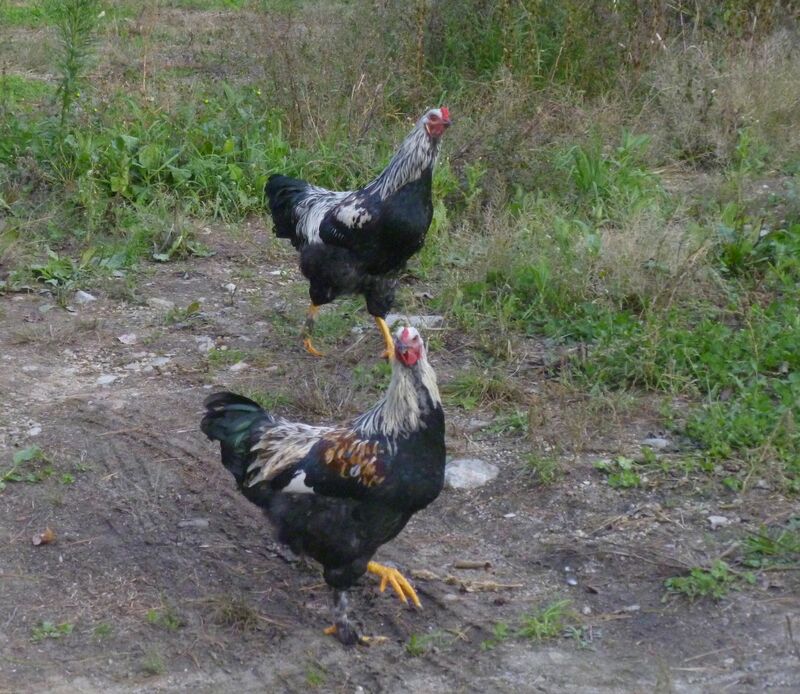 Some of our daily entertainment involves our remaining two laying hens. Bad Chicken #1 (aka Henny Penny) lives up with the sheep and goats, while Bad Chicken #2 (aka Chicken Licken) hangs out behind the house and in the garage. 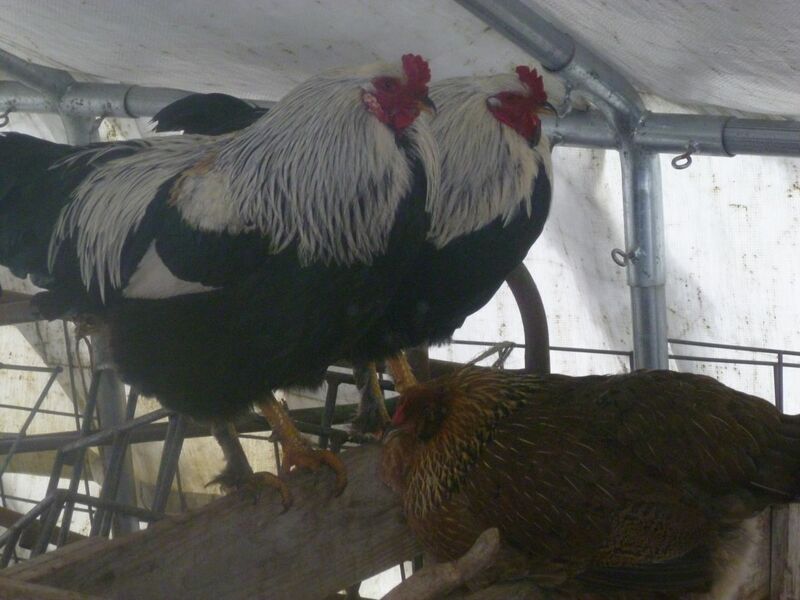 They have both had a bout of broodiness which we tried to use to our advantage by adding some fertile eggs to Henny Penny’s nest. We really should have bet on Chicken Licken as she gave those 17 eggs of hers almost 7 weeks. 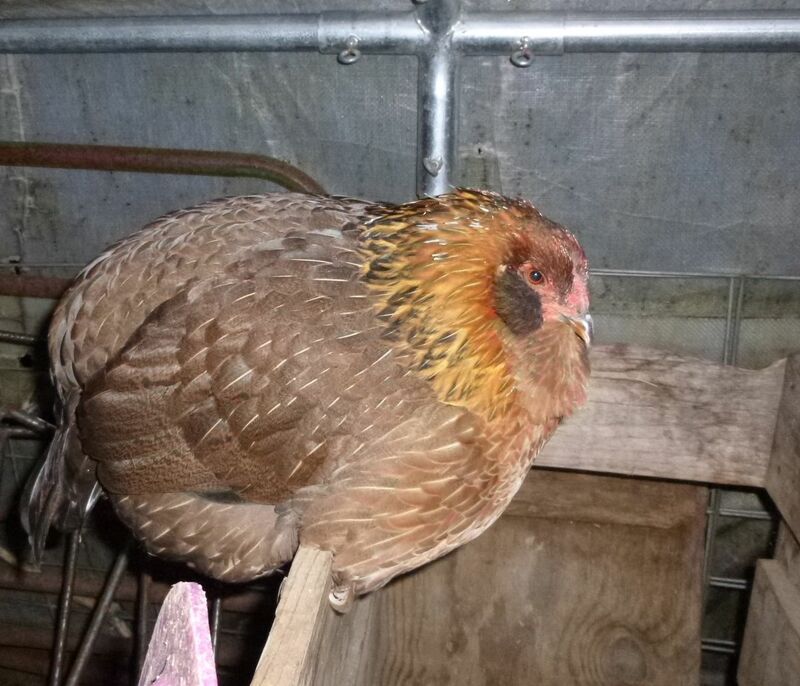 Henny Penny’s nest was raided a short time after we got some good eggs under her and all of her eggs were eaten. But our clucky #2 gave it her best. And now she is really becoming a pest… during her broodiness she only left the nest about twice a day, looking for food. 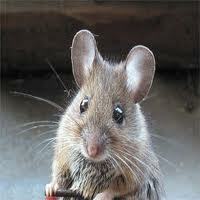 She puttered around under the bird feeder by the back door and so we began to throw some scratch out there for her. I guess that wasn’t the smartest thing to do as now she comes right up onto the back steps and pecks at the screen door, making a big fuss, and leaving us other surprises on the stairs as well. She and the chihuahua have faced off a little on each side of the door, but the chicken always wins that war of nerves! We knew it was a longshot. 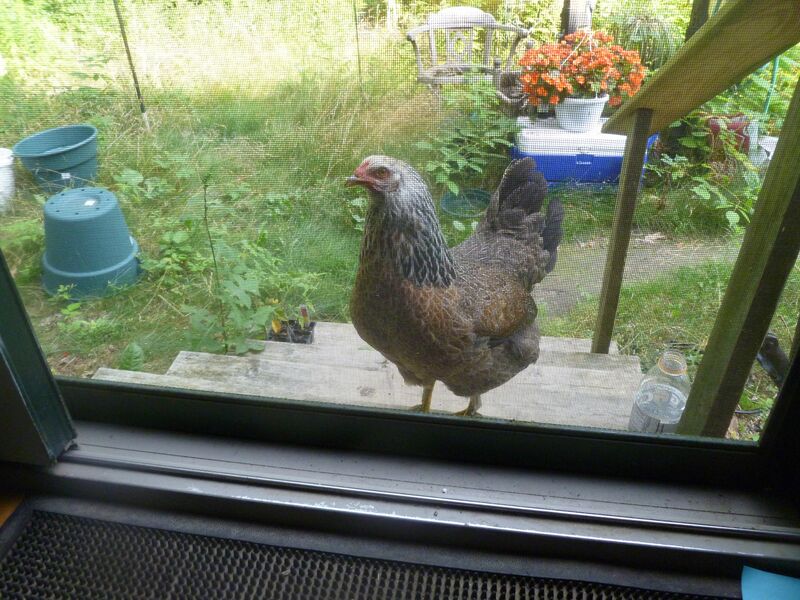 Henny Penny (aka Bad Chicken) has been a resourceful survivor for two years now. We couldn’t keep her in any pen right from the beginning and she has been a successful forager from the start. We removed her rooster friends quite awhile ago now as they were beating her to pieces and almost killed her. A few weeks ago she went clucky. Right about the same time our other bad chicken went clucky. Both have been sitting on massive piles of eggs. Neither of them are in a very safe location as neither or them prefer to be caged in any way. 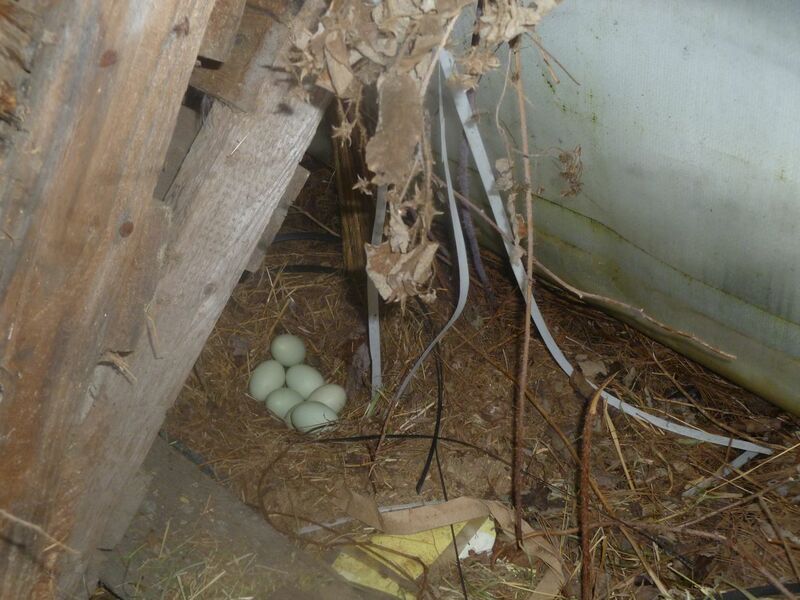 So bad chicken number 2 has a nest in the garage and she has been sitting on 17 eggs for just about 20 days now. She comes out once or twice a day to forage for food and harass us around the back door. I do not believe that she has any fertile eggs, but she will figure it out soon enough. 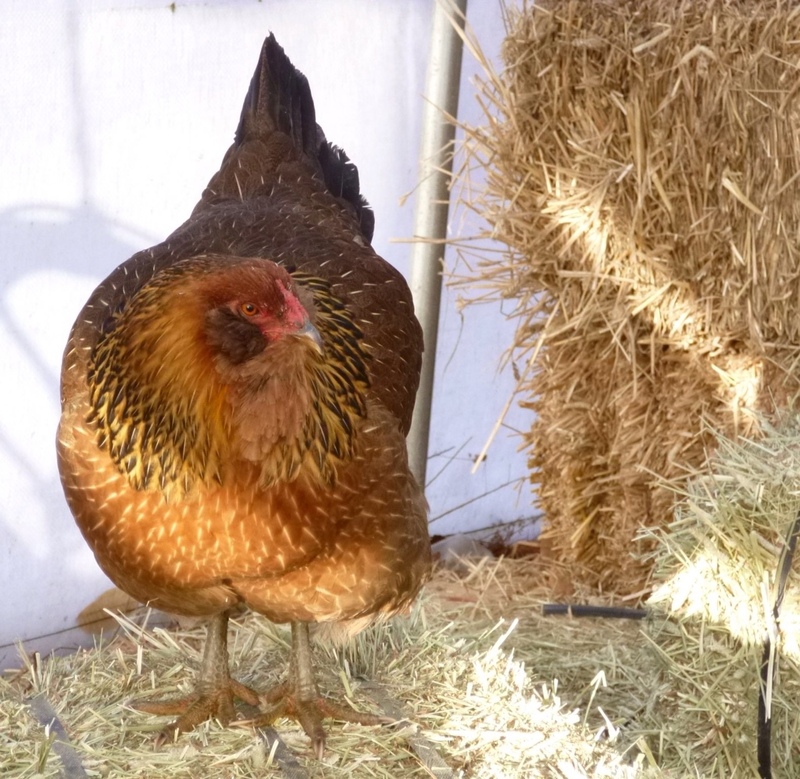 Henny Penny was a little behind her in timing. When she began sitting on her eggs I went to a friend’s house and got 8 fertile eggs which we slipped into her nest while she was eating. She has been doing really well, in a depression of dirt covered with weedy growth in the milking greenhouse. It is definitely not a safe spot, open to the yard and paddock areas. Every morning I go out and check to make sure she is still there, and up until today she has been doing very well. When I went in there this morning I realized that she wasn’t there, but outside foraging for food. Unusual, but not out of the question. When I went in to look at her nest I realized that it was all askew. Egg shells all over the place, with two whole eggs left in the weeds. Henny Penny survived to live another day, but I guess our experiment in having a hen hatch her eggs has come to a screeching halt! At least Henny Penny is still with us. I don’t know what attacked the nest, but she was smart enough to get out of the way before she got hurt! For the past 7 or 8 months we have had a small roving band of chickens which included our lone guinea male. He tagged along with the Henny Penny and the two roosters for part of the day, but always ended up by himself calling inconsolably for his mate, who was dragged off early last summer. He calls for hours every day and was beginning to drive us crazy! Last week our neighbor decided that he no longer wanted his guinea fowl as he is starting to plant his garden and doesn’t want them digging up the seed. My husband wasn’t sure that I would want more in the yard again, but I thought it might give our guinea boy some peers and maybe even some solace. So we brought them down and it’s been amazing! Our male took right to the little group and now we have 5 happy guineas wandering the property again. Every once in awhile they set up the alarm, but no longer do we have one screaming for company any more. Phew. I love it when a plan works! 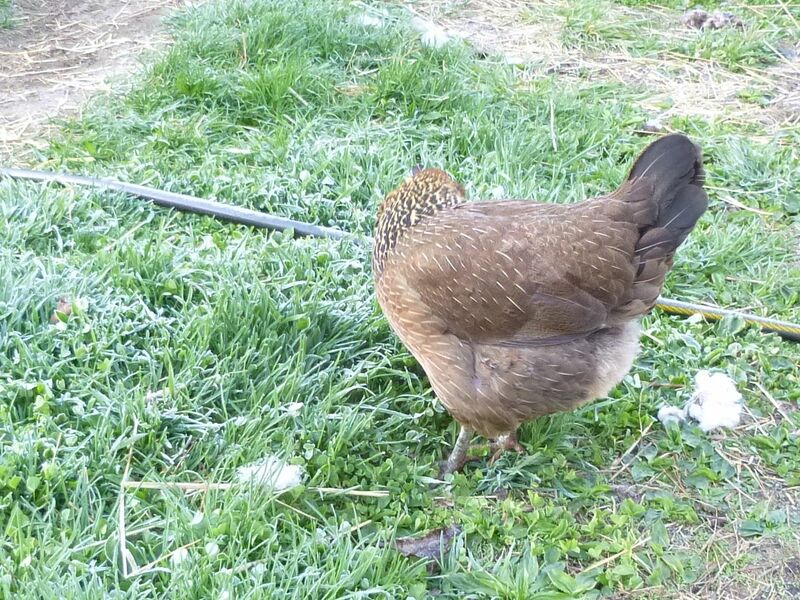 Our little brown chicken girl, Henny Penny, is still on the loose and still palling around with the two bad roo boys (I guess it’s the “good girl/bad boy attraction” here!). They seem to have gotten through the winter pretty well, roosting in the milking greenhouse and just generally grazing the compost piles as well as the grain that I put out for them. They got lucky that it was a mild winter, so things that are usually frozen in, are not this year. And the weekend is nearly over. Big sigh! We had a snow day on Friday and it became a most relaxing 3 days. As far as the goats go, things seem ok. Everyone is looking good, although the weather has been very uncooperative. The rain we had on Friday got rid of most of the snow and a little of the ice, and left more ice in its wake. The paddocks are skating rinks and even the sheep and goats are skittering around on it. 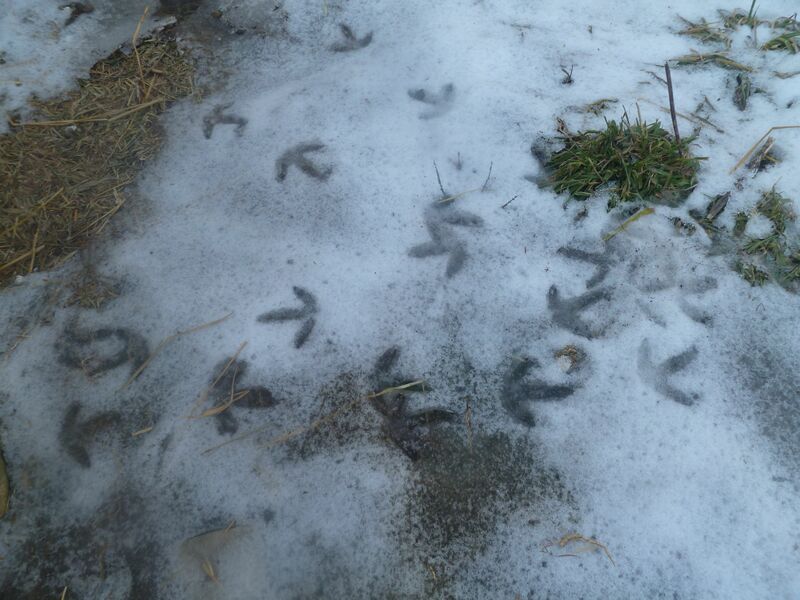 The only amusing thing is that the chicken tracks in the icy snow have grown to monster proportions in the partial thaw! They actually look pretty all over the ground. On another front, our spinning group has decided to do a “knit-along.” We are going to be knitting sweaters together and have chosen patterns from Knitting Pure and Simple. The pattern I have chosen is a fairly straight-forward cardigan, and I want to knit one in the blue family. As I have enough skeins of silver worsted wool, I decided today that I would dye them up for the project. 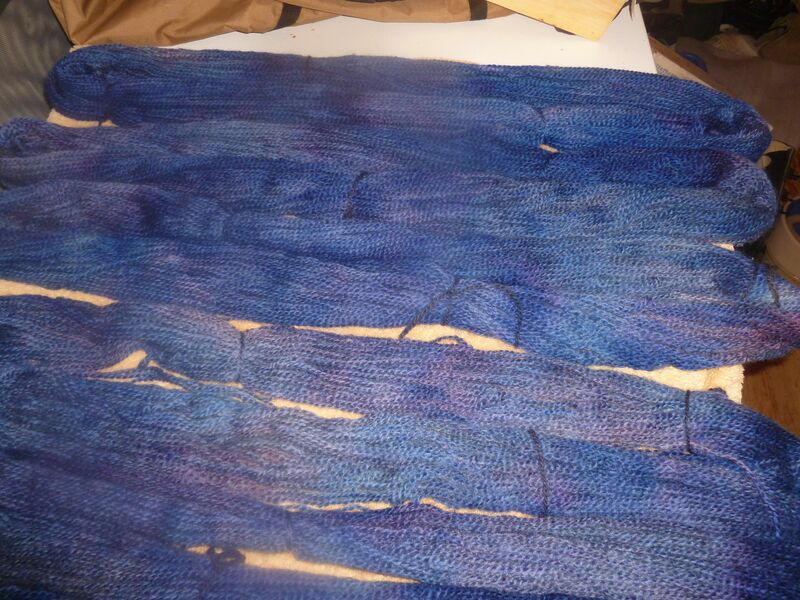 I need 6 skeins for the project, but I am a fairly loose knitter so I decided to dye 8 skeins. After the first 6 skeins I was running out of my major color… so who knows how this will go? I may have to over-dye the two extras and use them for the trim or something, but I guess I will see! It sounds worse than it really is, although I have spent so much time thinking about this little friend of mine that I really do feel the need to mark her passing. Her name was Miss Marple. She has kept me company since late last winter in the milking greenhouse. Morning and evening, she came out to spend some time with me while I milked the does. 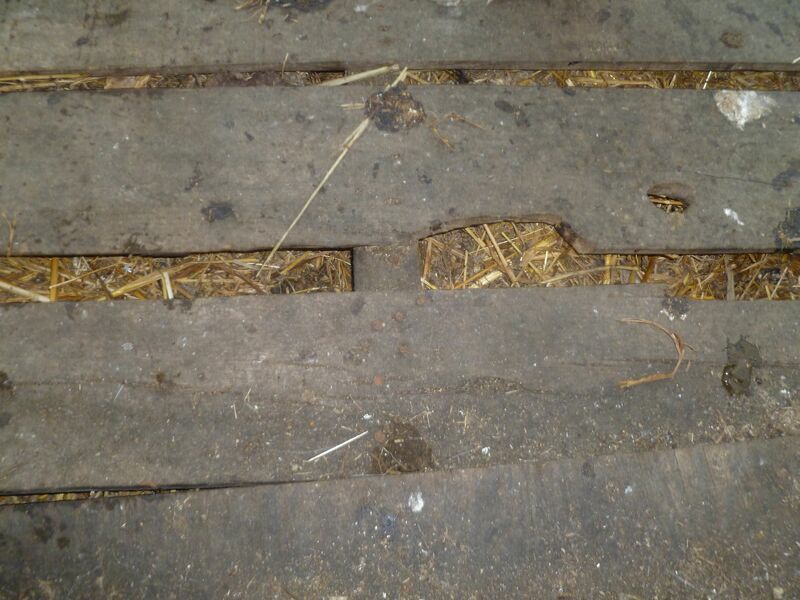 Just a little brown field mouse, she had created (along with a whole host of progeny and relatives I am certain) a maze of mousey tunnels under the pallets that support the plywood floor where I milk. Both ends of this greenhouse are open to the elements, and truthfully, the cover has more holes in it than not, so it is not a closed-in space, but very airy and open. In spite of that, she had a warren of stolen fleece, straw and hay under those pallets and I am sure it is quite cozy under there. Our does are very sloppy eaters, and when I have them on the milkstand, they dig in with great gusto and grain flies all over the place. Miss Marple has made it a habit to be inquisitive about what was shooting around there and got so bold as to come out from the underside of the pallet and dart around picking up loose grain. Even when nothing was falling, she would run back and forth under the pallet so I could see her rushing around, and then she would venture out, sit up on her hind end and twitch her little whiskers at me and at the does. We would chat, pass the time of day, talk about the weather, and then when I got up to take the does off the stand, she would run back inside and rearrange her little house. It was a rare day when I wouldn’t see her morning and evening, and in-between times I saw her racing around outside, gathering tidbits. Last weekend I went out to move some panels prior to getting the ewes home. As I walked the path between the milking greenhouse and the paddock I saw Miss Marple. Her inquisitiveness was probably her undoing. That and the fact that the 3 rogue chickens and the guinea male were probably hungry, as they are always hungry. Poor mousey had been pecked and left behind. She may have even expired and then been tasted and found unsavory by the chickens, but she did have peck marks all over her little body. And so it goes on the farm. My husband just rolls his eyes but I really have appreciated my time with Miss Marple, the very well-fed and inquisitive field mouse!